While every Census faces challenges and even controversies, the count remains important because it’s the federal government’s very first responsibility to the U.S. Constitution, the cornerstone of the nation’s representative democracy and America’s largest peacetime activity, said Terri Ann Lowenthal, a consultant to many census stakeholders and former staff director for the U.S. House Subcommittee on Census and Population. “I think of unprecedented factors that could thwart a successful enumeration – one that counts all communities equally well,” said Lowenthal, who consults on The Census Project, a collaboration of business and industry associations; civil rights advocates; state and local governments; social service agencies; researchers and scientific societies; planners; foundations; and nonprofits focused on housing, child and family welfare, education, transportation, and other vital services. “The risks include cyber-threats foreign and domestic, IT failures, weather events that have become more extreme, disinformation campaigns, and the unknown consequences of adding a new, untested citizenship question,” she said. 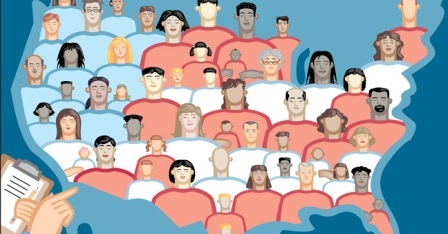 The official kick-off to the 2020 Census begins Monday, April 1 in Washington where the U.S. Census Bureau will host a live operational press briefing to mark the one-year out milestone from the 2020 Census. Bureau Director Dr. Steven Dillingham and others in leadership plan to brief the public on the status of operations and provide updates on the success of the integrated partnership and communication campaign. Lowenthal said the unknown consequences of adding a new, untested citizenship question are among the growing challenges facing the 2020 Census. She noted other challenges including consistent underfunding and President Trump’s budget request for next year, which is well below the amount needed; distrust of government at many levels; and fear among immigrants that their census responses will be used to harm them and their families. “An inclusive, accurate census is especially important for Black Americans and other people of color,” Lowenthal said. “The census determines the distribution of political power, from Congress, to state legislatures, to city councils and school boards, and guides the allocation of almost $9 trillion over the decade in federal assistance to states and communities for hospitals, public transit, school facilities, veterans services, Medicaid, school lunches, and many other vital services,” she said. Unfortunately, advocates say the census is not an equal opportunity enumeration. Scientific yardsticks since 1940 reveal that the census misses Black Americans at disproportionately high rates, especially Black men ages 18 to 49 and Black children under age five. “At the same time, the census over-counted non-Hispanic Whites in 2000 and 2010. And because the people who are more likely to be missed do not live in the same neighborhoods as those more likely to be double-counted, some communities get more than their fair share of political representation and resources, while others get less than they deserve and need,” Lowenthal said, adding that we then must live with those results for the next ten years. The Census is a civil rights issue with huge implications for everyone, particularly people of color, added Beth Lynk, the director of the Census Counts Campaign at The Leadership Conference Education Fund. “Census data are used to draw congressional district lines and help determine the amount of federal funding communities receive for programs like Head Start and SNAP,” Lynk said. “Communities that are missing from the census lose out on what they need to stay safe and healthy. Unfortunately, Black people and Latinos are considered to be harder to count, and accurately counting these populations takes a focused effort,” she said. Census data are inherently personal; the data record and codify individual stories, and help to paint a mosaic of rich racial, ethnic, cultural, and geographic identities, said Jason Jurjevich, Assistant Director of the Population Research Center, a research institute in the College of Urban and Public Affairs at Portland State University in Oregon. “Telling the story of diverse communities, including individuals of color, requires a fair and accurate count,” Jurjevich said. “As with any census, an all too common obstacle is that some individuals are excluded, resulting in an undercount. In the 2010 Census, considered one of the most accurate censuses in recent American history, 1.5 percent of Hispanics and 2.1 percent of African-Americans were undercounted,” he said. Jurjevich added that among African American men, ages 30 to 49, the undercount was much higher, at 10.1 percent. The decennial census is the one chance, every ten years, to stand up and be counted, Jurjevich added. Also, he noted that Census 2020 will offer the first-ever online response option, which could improve census response rates and, at the same time, numerous challenges and barriers will likely make it more difficult to count Americans in the 2020 Census. “This means that communities will need to organize and address on-the-ground challenges like the proposed citizenship question, increasing public distrust in government, growing fears among immigrants about the current sociopolitical climate, the first-ever online response option and concerns around the digital divide and security of personal data, and inconsistent and insufficient federal funding,” Jurjevich said. Each community should first consider developing a Complete Count Committee – or CCC, he said. “A CCC is a volunteer committee established by tribal, state, and local governments and community leaders to increase awareness of Census 2020 and increase census participation,” Jurjevich said. The first step for CCCs is to develop a Complete Count Plan. The plan should identify local barriers to a fair and accurate count, identifies potential sources of funding, build on the strength of trusted community voices, and develop culturally resonant messaging, Jurjevich said. “For all to count, all must be counted,” he said.